Born in New Lexington, Ohio, in 1862, Zahm received undergraduate and master's degrees from Notre Dame University and a doctorate from Johns Hopkins University. He taught mathematics and mechanics at Notre Dame University (1885-92) and at The Catholic University of America (1895-1908). A principal organizer of the 1894 international conference on aeronautics, he was also an early and persistent champion of the creation of a national aeronautical laboratory. 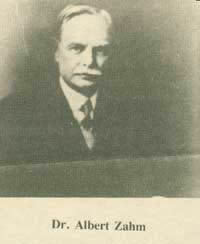 From 1916 to 1929 he was the director of the Aerodynamical Laboratory of the U.S. Navy. He was named Guggenheim Chair of Aeronautics at the Library of Congress, a position that was created for him (1929-1946). He designed and built the first significant wind tunnel in the United States (1901) and was awarded the Laetare and Mendel medals for his significant achievements in the field of aeronautics. An inventor of precise measuring instruments, he was also known for designing the "Zahm shape," making breakthrough discoveries on skin friction and aerodynamic drag, and inventing the airplane control stick.